I love all the sweet, savory, gooey goodness that Christmas brings to my doorstep as much as the next girl, but sometimes I feel like after a couple weeks of holiday well-wishing I could just roll away and sleep the rest of the season in a deep, sugar-induced slumber. I remember opening the door one night to an eager neighbor stand there with a plate full of fresh, warm, wonderful cookies. My boys came rushing to the door to see who was bringing the next plate of �cheer� and my oldest, who was 4 at the time, said, �Cookies�I don�t know if I can eat any more cookies!� If was one of those horrifyingly embarrassing moments in parenthood that children so often provide! Though I was not terribly amused at the moment, my moment and I giggled about my son and all the treats that we indulge in as they approach. A couple of nights later another neighor came buy with a plate of cookies�.this time in the form of frozen dough. A simple note said, �In this crazy world everyone should believe in something. 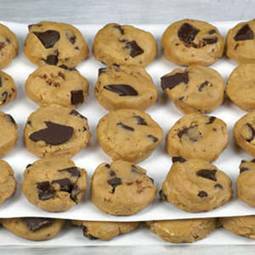 WE believe that you should have another cookie.� Then the freezing and baking instructions were printed below that. What a genius idea! It was easier for her because she didn�t have to bake them all and it was wonderful for us because we put them in the freezer until after Christmas when our blood sugar levels were finally starting to return to normal levels once again. By then my kids were more than glad to eat every last cookie! Since then my sisters and I have thought of a few more ideas for making fantastic gifts from our kitchens that don�t have to be eaten right away and I would like to share them you! 1. Frozen cookie dough � Just as my neighbor did you can give frozen cookie dough. This gives you the opportunity to share your favorite recipe, but saves you a lot of time since you don�t have to tend the oven dozen after dozen! Make sure to include the directions for baking and put them in a nice freezer bag so they will taste right after spending some time in the freezer. 2. Cookie Jars � These are so fun and really cute. They offer the same convenience of being used down the road and they can be made very affordably. My sisters and I gathered at our mom�s house and made them together. We set up an assembly line and filled a whole lot of bottles very quickly�and with a lot of laughing added in there! 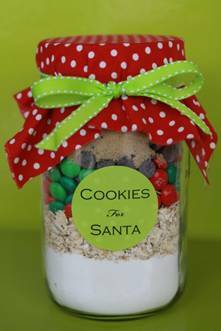 If you are looking for recipes and great ideas for mixes to use check out Cook�n Gifts in a Jar. 3. 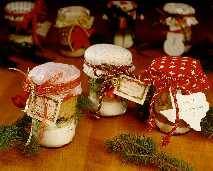 Soup in a Jar � Gifts don�t all have to be sweet! I loved the gifts my sister put together with this idea. She chose a delicious soup mix and layered it into the bottles so it was just beautiful. The she topped the jar off with cute fabric and ribbon and gave it with a bag of oyster crackers. It was a hit!!! Again, Cook�n Gifts in a Jar has amazing recipes for soups, cookies, beverages, and more! 4. Dinner In A Basket � This is a fun way to share your family favorites with loved ones. Place all the non-perishable ingredients to a meal in a basket with the recipe and give them a meal ready to be prepared! Better yet, add in your favorite Cook�n title so they can keep enjoying it long after the basket of food is eaten. You can also get creative with this gift. 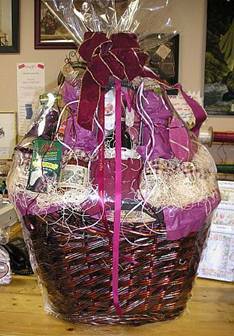 If you are doing a pasta meal you could use a colander in place of a gift basket. Pots, pans, and baking dishes can all be used if they fit with the ingredients and recipe you are using. I hope that this holiday season brings you wonderful memories, tasty treats, fabulous friends, warm moments with your family, and more happiness than you can dream of!